There is a Palm Beach hotel that is ideal for all types of beach goers including couples and families that want to find a perfect stretch of beachfront. Couples looking for a trendy boutique with historic flare can try the Colony Hotel or the upscale Tideline Ocean Resort and Spa. If you want a historic luxury resort with plenty of onsite amenities then the Breakers is perfect or you can find modern luxury with personalized touches at the Four Seasons Resort, Palm Beach as well as Eau Palm Beach Resort and Spa. Families searching for resort style amenities, a full kitchen and a kid’s club should try the Marriott's Ocean Pointe, Palm Beach Shores and Vacation Villas or Palm Beach Marriott Singer Island Beach Resort and Spa. 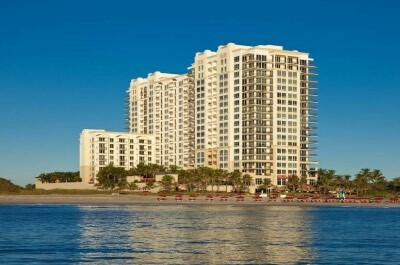 Beach goers that want an easy walk to several beach parks can stay at the Hilton Singer Island Oceanfront/Palm Beaches Resort. 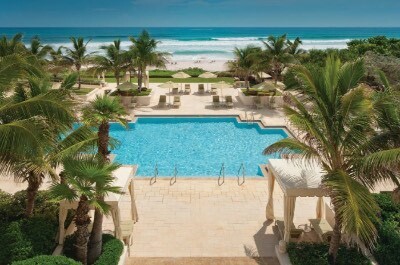 The Four Seasons Resort, Palm Beach is a perfect luxury Palm Beach hotel for all types of travelers including families that want personalized services, great beach access and plenty of resort style amenities onsite. Located midway between Palm Beach and South Palm Beach, the Four Seasons Resort, Palm Beach is situated directly on the beach overlooking the Atlantic Ocean and is less than 40miles away from the Palm Beach Zoo at Dreher Park. The Four Seasons Resort, Palm Beach has a modern four floor architectural style with 210 rooms and suites that feature an elegant each decor. Rooms range in size from 393 to 546 square feet with a choice of bedding, a sitting area and a private balcony that offers a view of the resort, pool or ocean. One-bedroom suites have 685 square feet with a separate living room that has a sofa sleeper, floor to ceiling windows, 1.5-bathrooms and a private balcony that features oceanfront views. Two-bedroom suites are sized at 1,370 square feet with a separate living room with a sofa sleeper, floor to ceiling windows, 2.5-bathrooms, dining area and a private balcony that has ocean views. The Four Seasons Resort, Palm Beach has a nice stretch of private beachfront where you will find lots of space to relax and there is watersport equipment rentals onsite. The Four Seasons Resort, Palm Beach is within an easy walk to several attractions such as the Snooks Island Natural Area, the William O. Lockhart Municipal Pier as well as R.G. Kreusler Park and you are 6-miles from CityPlace. There are complimentary bicycles and traveling to attractions by house car service is available. The property has a kid’s club with organized activities for children. The Four Seasons Resort, Palm Beach hotel has a freshwater swimming pool, a fitness center, shopping boutique and a full service spa. Dining at the resort includes Graze has breakfast as well as lunch, the Atlantic Bar and Grill serves lunch and Jove Kitchen and Bar serves dinner. Offsite dining within a short distance of the resort includes Mulligans Beach House Bar and Grill for seafood, Rustico Italiano Ristorante and Brogues Downunder. Nightlife includes a quiet drink at Benny’s on the Beach or you can take a drive to Clematis Street where you will find plenty of entertainment venues. When you are interested in a historic resort-style luxury Palm Beach hotel that boasts plenty of onsite amenities, has perfect beach access and is ideal for all refined travelers then you should stay at the Breakers. Located just north of Palm Beach along the Atlantic Ocean coastline, the Breakers is situated on 140-acres of lush gardens directly on a private beachfront and is 0.5-miles away from the Henry Morrison Flagler Museum. The Breakers was originally constructed in 1896 with a Renaissance Revival eight story architectural design with 540 rooms and suites that sport a chic European influenced interior. Deluxe rooms have 300 square feet with a small sitting area and premium rooms are 400 square feet with a partial-ocean or resort view from large picture windows. Atlantic rooms have 460 square feet with a sitting area, floor to ceiling windows and a Juliette balcony that boasts an oceanfront view. Flagler Club rooms range between 300 to 550 square feet with upgraded amenities like chauffer service, personal butlers, private lounge with complimentary food and drink. There are eleven categories of suites that range in size from 500 to 1,700 square feet with various floorplans including junior and classic suites. Suites have multiple bathrooms, sofa sleepers and some have open floorplans while others have separate living as well as dining rooms. Suites with ocean views have multiple Juliette balconies and floor to ceiling windows. 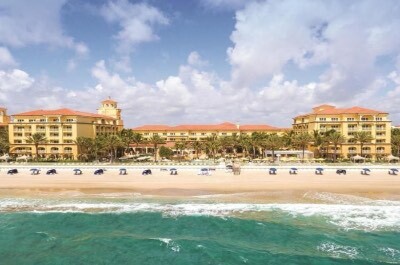 The Breakers Palm Beach hotel has a fabulous half-mile stretch of private beach where you will find complimentary beach equipment and watersport activities can be rented onsite. The Breakers is close to many attractions such as Bethesda-By-The-Sea, Worth Avenue and the Lake Trail. The property has five freshwater swimming pools including an adult only pool as well as two children friendly pools and there are private bungalows available for rent poolside. The Breakers has numerous onsite amenities that include two 18-hole golf courses, tennis courts, a kid’s club, a movie theater, a game room, ten shopping boutiques, a fitness center and a full service spa. Dining at the resort includes nine restaurants such as the Circle or the Beach Club Restaurant for breakfast; the Ocean Grill, Flagler Steakhouse and the Seafood Bar for lunch and dinner; the Italian, Echo ad Top of the Point serve dinner only. Nightlife onsite includes the trendy HMF for a lively atmosphere and the Seafood Bar has glass aquariums. If you are interested in personalized luxury services, close proximity to shopping and the beach then the best Palm Beach hotel for you is the Colony Hotel. Located in the heart of Palm Beach just 2-blocks from Worth Avenue, the Colony Hotel is a 1-block walk to Mid-Town Municipal Beach and is a 20-minute walk to the Society of the Four Arts. The Colony Hotel has a splendid Colonial five floor architectural style with Art Deco accents that contains 90 rooms and suites which have been recently renovated with a bright old world charm decor. Standard, Premium and Superior rooms are available with various floorplans that include a choice of bedding and boast a view of the city or ocean from large picture windows. Junior suites are larger with a choice of bedding, a separate sitting area and views of the surrounding area from picture windows. One and two-bedroom suites are perfect for families with various bedding options, a separate living room, multiple bathrooms and views of the surrounding area including the ocean. The Presidential Penthouse suite has two-bedrooms with over 1,600 square feet of living space, a dining room, living room, full kitchen and a big view of the Atlantic Ocean. There are also two-bedroom villas which are located in a historic mansion that range in size from 900 to 2,700 square feet. These feature private balconies/patios, a full kitchen, 2-bathrooms and there is a separate private pool for villa guests. The Colony Palm Beach hotel is a short walk to Mid-Town Municipal Beach where you will find plenty of sand for lounging and numerous watersport opportunities can be arranged at the hotel. 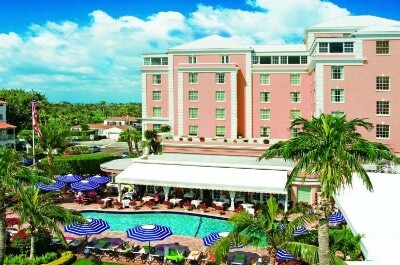 The Colony Hotel is within 1.5-mile to the Henry Morrison Flagler Museum, the CityPlace and the Norton Museum of Art. The property has a nice freshwater swimming pool with a sundeck and poolside service. Dining onsite includes Cafe 155 for quick bites during breakfast as well as lunch and all three meals are served at the Polo Steakhouse. Offsite dining within walking distance is plentiful with Buccan for contemporary fusion cuisine, Costa Palm Beach serves Mediterranean dishes and Charley’s Crab prepares seafood. Nightlife is superb at the Colony Hotel where you can find live entertainment every evening at the Royal Room. When you want to find a mid-range all-suite Palm Beach hotel that is superb for families with lots of onsite activities for children, is close to attractions and boasts a great beach area then the Marriott’s Ocean Pointe is ideal. Located on the southern portion of Singer Island in the Palm Shores Break area, Marriott’s Ocean Pointe has a stretch of private beachfront as well as manicured gardens and is 1.5-miles away from the Manatee Lagoon. The Marriott’s Ocean Pointe has a modern seven story architectural design with Spanish Revival accents which contains 341 rooms and villas that boast a bright beach interior. Rooms have 300 square feet with a small kitchenette (microwave and refrigerator), sitting area that has a sofa sleeper and a private balcony that offers views of the ocean. One-bedroom condominiums are sized at 850 square feet with a separate living room with a sofa sleeper, dining area, full kitchen and a private balcony that has ocean views. Two-bedroom units have 1,200 square feet with a separate living room, full kitchen, dining area, 2-bathrooms and a private balcony that has ocean views. Three-bedroom condominiums are 1,550 square feet with a separate living room and sofa sleeper, a full kitchen, dining area, 3-bathrooms and two balconies that offer a view of the Atlantic Ocean. The Marriott’s Ocean Pointe Palm Beach hotel has a perfect spot on a private beachfront where you will find lots of room to lounge and watersport activities can be arranged onsite. Children will be thrilled with the added amenities of a kid’s club that features organized events, a Splash Pad pool area, playground and a miniature golf course. The Marriott’s Ocean Pointe is within 5-miles to several attractions like the PLAYMOBIL FunPark, Peanut Island Park and Rapids Water Park. The Marriott’s Ocean Pointe has two freshwater swimming pools with nice sundecks, tennis courts, shuffleboard, bocce ball and a fitness center. Dining onsite at the resort includes a home cooked meal in your suite or you can find lunch as well as dinner at the High Tides Pool Bar and the On the Rocks Pool Bar and Grill. Offsite dining choices within a 2-mile drive include Johnny Longboats, the Pelican Cafe and the Southern Kitchen. Nightlife includes live music on select nights at one of the pool bars or you can enjoy a cold libation at the Two Drunken Goats Beach Cantina. The Tideline Ocean Resort and Spa is an upscale boutique Palm Beach hotel that is perfect for couples looking for a trendy but calm atmosphere, easy access to the beach and plenty of quality amenities. Located south of Palm Beach in the Lake Worth area, the Tideline Ocean Resort and Spa is situated directly on a private beachfront with gorgeous views of the Atlantic Ocean and is 7.5-miles away from the Henry Morrison Flagler Museum. The Tideline Ocean Resort and Spa has a sleek modern five floor architectural style with 134 room and suites that feature a chic contemporary decor. Rooms are sized at 320 square feet with most rooms furnished with a king size bed, floor to ceiling windows and a private balcony/patio that offers views of the gardens, pool, partial or full ocean view (pool view rooms boast a private cabana poolside). One-bedroom suites have 640 square feet with a separate living room, floor to ceiling windows, soaking tub and a verandah that features a full ocean view. The Tideline Ocean Resort and Spa Palm Beach hotel has a great spot on a private beachfront where you will find complimentary beach equipment as well as plenty of watersport opportunities which can be arranged by the resort and drink service is available. The Tideline Ocean Resort and Spa is within a short walking distance to many attractions such as the William O. Lockhart Municipal Pier, the R.G. Kreusler Park and you are 4-miles away from the Palm Beach Zoo at Dreher Park as well as 6-miles from shopping on Worth Avenue. The property has a nice freshwater swimming pool with a sundeck as well as drink service, a fitness center and a full service spa. Dining at the resort includes Brandon’s for all three meals including a Sunday brunch and Mizu serves Japanese specialties in the evening. Dining options offsite within a short distance include Jove’s Kitchen and Bar for Italian dishes, Benny’s on the Beach serves seafood and Callaro’s Steak House. Nightlife includes a drink at the trendy onsite bar or you can walk to the Lake Worth Playhouse for a live performance and the Bamboo Room has live jazz. If you are looking for a luxurious upscale Palm Beach hotel that has top notch amenities, plenty of onsite activities, easy beach access and is within a short drive to several attractions then you should stay at the Eau Palm Beach Resort and Spa. Located in the Manalapan area of South Palm Beach, the Eau Palm Beach Resort and Spa is situated on 7-acres of lush tropical gardens directly on the beach overlooking the Atlantic Ocean and is a 6-mile drive to the Palm Beach Zoo at Dreher Park. The Eau Palm Beach Resort and Spa has a modern six story architectural design with Spanish Revival accents that contains 309 rooms and suites which sport a chic European beach interior. Rooms have a variety of floorplans with a choice of bedding and a private balcony that offers views of the resort, gardens, partial-ocean, pool and oceanfront. Suites vary in layout with separate living rooms, a choice of bedding; some have in-suite Jacuzzi’s and a private balcony with views of the garden, pools or oceanfront. The Eau Palm Beach Resort and Spa has a great private beach area where you will find beach equipment and a plethora of watersport activities through the hotel or outside vendors. The property also has several species of turtles that nest on the beach which makes for an interesting learning experience about the local ocean eco-system. The Eau Palm Beach Resort and Spa has a kid’s and teen’s club to help keep everyone occupied while at the resort. The Eau Palm Beach Resort and Spa is a short drive away from Worth Avenue, Lantana Nature Preserve and you are 8-miles away from the Norton Museum of Art. The Eau Palm Beach Resort and Spa has two freshwater swimming that overlook the Atlantic Ocean, a fitness center, fire pits, tennis courts and a full service spa. Dining at the resort includes the Temple Orange Mediterranean Bistro for all three meals, the Ocean Breeze Kitchen serves lunch as well as dinner and Angle Restaurant prepares dinner. Offsite dining options within an easy walk or drive include John G’s Restaurant, the Dune Deck Cafe and Basil has Italian specialties. Nightlife includes a drink by the fire pits at Stir Bar and Terrace or you can catch a live performance at the Plaza Theater. The Marriott’s Oceana Palms is a fantastic luxury oriented family-friendly Palm Beach hotel that boasts condominium style units, numerous amenities for children and quick beach access. Located along the central coastline of Singer Island overlooking the Atlantic Ocean, the Marriott’s Oceana Palms is directly on Riviera Beach and is 5.5-miles away from the Rapids Water Park. 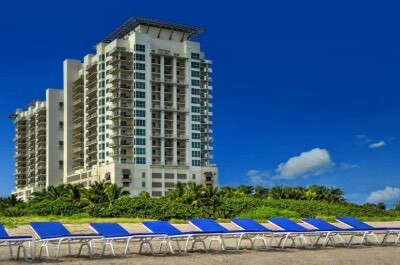 The Marriott’s Oceana Palms has a modern twenty floor architectural style with 159 condominium style units that feature a contemporary beach decor. Two-bedroom villas have 1,150 square feet with a separate living room that has a sofa sleeper, a full kitchen, floor to ceiling windows, 2-bathrooms and a private balcony that boasts a partial or full ocean view. The Marriott’s Oceana Palms has a great place on the beachfront where you will find plenty of room to relax and there are numerous watersport activities available through local vendors as well as the hotel. Children will like amenities such as a climbing wall, a kid’s club with organized activities, a teen lounge and a Splash Zone at the pool. The Marriott’s Oceana Palms is only 0.5-miles to Ocean Reef Park for snorkeling, 1-mile to Peanut Island Park and 2-miles to the Manatee Lagoon. The Marriott’s Oceana Palms Palm Beach hotel has two freshwater swimming pools that are complete with fountains and a Splash Zone for children, shuffleboard courts, barbeque grills, a fitness center and a full service spa. Dining at the resort includes a casual home cooked meal in your condominium or you can enjoy the Bistro for all three meals and Reflections Bar and Grill serves poolside for lunch as well as dinner. Dining options within a short distance include Guakamoles Mexican Grille and Cafe; the Pelican Cafe has Italian cuisine and the Brass Ring Pub. Nightlife involves a short drive to downtown West Palm Beach where you will find comedy at the Palm Beach Improv and CityPlace boasts numerous entertainment venues. When you are searching for a family-friendly mid-range Palm Beach hotel that offers quick beach access, is nearby to several attractions and has a quiet atmosphere then the Hilton Singer Island Oceanfront/Palm Beaches Resort is perfect. Located in the central portion of Singer Island adjacent to the Ocean Reef Park, the Hilton Singer Island Oceanfront/Palm Beaches Resort is directly on the beachfront with commanding views of the Atlantic Ocean and is less than 3-miles to John D. MacArthur Beach State Park. The Hilton Singer Island Oceanfront/Palm Beaches Resort has a modern eight story architectural design with 223 rooms and suites that feature a contemporary interior. Standard rooms are 223 square feet with a choice of bedding and a private balcony that offers a view of the coastline, Intercoastal Waterway, resort or Atlantic Ocean. Deluxe rooms have 251 square feet with a choice of bedding, a sitting area that has a sofa sleeper and a private balcony that sports views of the island, resort, Intercoastal Waterway or ocean. Junior suites are corner units with an open floorplan that has a sitting area, a king size bed and a two private balconies that feature views of the ocean, island and coastline. The Hilton Singer Island Oceanfront/Palm Beaches Resort has a beautiful stretch of private beach where you can lounge, swim and there are numerous watersport activities available through the hotel as well as vendors. The property has a fun kid’s club that keeps the children occupied with organized events throughout the day. The Hilton Singer Island Oceanfront Palm Beaches Resort is nearby to several attractions including 1-mile to Phil Foster Park for offshore diving, 5-miles away from Rapids Water Park and there is shopping at the CityPlace only 6-miles away. The Hilton Singer Island Oceanfront/Palm Beaches Resort has a freshwater swimming pool with poolside service and a fitness center. Dining onsite includes all three meals at Ketch and Coconuts on the Beach serves lunch as well as dinner. Offsite dining options within a short distance include Two Drunken Goats Beach Cantina for pub fare, the Southern Kitchen has comfort cuisine and Table 427 serves eclectic dishes. Nightlife includes live entertainment at Coconuts on the Beach on selected nights and you can take a quick drive to the Brewhouse Gallery for a craft beer or a 5.5-mile drive to Clematis Street where you will find plenty of entertainment venues. When you are interested in a mid-range condominium style Palm Beach hotel that offers resort amenities, is nearby to attractions and boasts perfect beach access then the Palm Beach Shores Resort and Vacation Villas is superb. Located on the south-central portion of Singer Island in the Palm Beach Shores area, the Palm Beach Shores Resort and Vacation Villas is directly on the beachfront overlooking the Atlantic Ocean and is less than 1-mile away from Peanut Island Park. 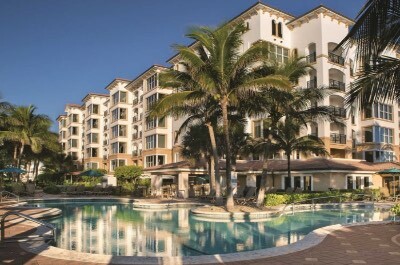 The Palm Beach Shores Resort and Vacation Villas has a modern six floor architectural style with Spanish accents and contains 260 condominium style accommodations that have a contemporary beach decor. One-bedroom condominiums have 560 square feet with a separate living room that has a sofa sleeper, a full kitchen, floor to ceiling windows and a private balcony with a view of the pool, Singer Island or Atlantic Ocean. The Palm Beach Shores Resort and Vacation Villas has an ideal place on a private beachfront where you will find beach equipment as well as plenty of watersport activities can be found from vendors and you are only a 5-minute walk from the Riviera Municipal Beach. Children will enjoy the kid’s club that boasts organized activities throughout the day and adults can indulge in games provided by the full time entertainment staff. The Palm Beach Shores Resort and Vacation Villas are within a short distance to many attractions that include 1.5-miles to Manatee Lagoon, 4.5-miles to the Henry Morrison Flagler Museum and you can walk to Phil Foster Park. The resort has a freshwater swimming pool with a poolside tiki bar, a fitness center and a full service spa. Dining includes a relaxing home cooked meal in your suite and the Islander Grill and Tiki Bar serves all three meals. Offsite dining options within a short walk include Guakamoles Mexican Grill and Cafe, Capt Jack’s Island Grill prepares seafood and the Seaside Bar and Grill. Nightlife includes movie nights, a cold libation at the Tiki Bar or you can take a 5-mile drive to CityPlace where you will find plenty of entertainment venues. 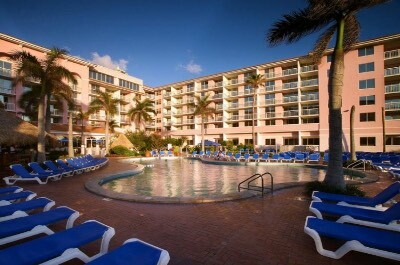 The Palm Beach Marriott Singer Island Beach Resort and Spa is a great family-friendly luxury Palm Beach hotel that offers plenty of resort-style amenities for children; is close to several attractions and has nice beach access then you should stay at the Palm Beach Marriott Singer Island Beach Resort and Spa. 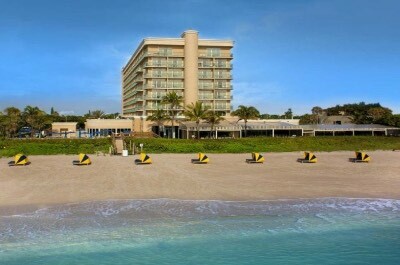 Located along the central shoreline of Singer Island adjacent to Ocean Reef Park, the Palm Beach Marriott singer Island Beach Resort and Spa is situated directly on the beach overlooking the Atlantic Ocean and is a 20-minute walk away from Phil Foster Park. The Palm Beach Marriott Singer Island Resort and Spa has a modern twenty story architectural design with 189 all-suite accommodations that feature a luxurious contemporary interior. One-bedroom condominium style units are between 750 to 800 square feet with a separate living room that has a sofa sleeper, a full kitchen, floor to ceiling windows and a private balcony that has a pool, resort or ocean view. Two-bedroom accommodations range in size from 1,045 to 1,300 square feet with various floorplans that include a separate living room that contains a sofa sleeper, a full kitchen, floor to ceiling windows, 2-bathrooms and a private balcony with a view of the Intercoastal Waterway, coastline or Atlantic Ocean. The Palm Beach Marriott Singer Island Resort and Spa has a perfect spot on the sandy beachfront where you will find complimentary beach equipment and you can arrange for your favorite watersport equipment rentals onsite. The property is ideal for children and there is a kid’s club that boasts organized events throughout the day as well as numerous children friendly amenities. The Palm Beach Marriott Singer Island Resort and Spa is a short drive to many attractions such as the John D. MacArthur Beach State Park, Peanut Island Park and you are less than 7-miles away from the CityPlace. The resort has two freshwater swimming pools that include a lagoon-style pool with a waterslide, an Infinity pool, a fitness center and full service spa. Dining onsite includes lunch at the Reef Tiki Bar or the Lagoon Cantina and you can find all three meals at 3800 Ocean Restaurant as well as enjoy a home cooked meal in your suite. Offsite dining within walking distance includes the Ketch, Johnny Longboats and Pizza Lino. Nightlife at this Palm Beach hotel nearby includes a cold libation at the Two Drunken Goats or live music at Coconuts on the Beach.